Sometimes, as parents we do think that kids are making it up when they cry or try to draw attention, but it may not always be the case. Please read this story below about a mother who thought her child was making it up and that the child does not want to go to school. A mother dropped off her child at school without running a proper check on uniform, shoes and content of the bag her child takes to school. This child was crying so bad not knowing that she had a scorpion in her shoes biting her all the way from home. Yes you heard me right!!! “Scorpion in her shoes”. We were made to understand that she came to school in tears and was dragged down from the car all the way to class by her mum. The mother refused to offer any reasonable explanation and only said “don’t mind her, she is being naughty, she doesn’t want to come to school and is only using leg pain as an excuse”. Something that mothers do, they make this comment about “their child not wanting to”, this believe made the scorpion to successfully attacked this girl’s leg the more. So when they were in the class with other pupils, this child kept screaming at intervals while crying uncontrollably. She didn’t participate in the drills as she came a little bit late. She didn’t even touch her test paper either, she kept on screaming while her classmates were fully participating in a fun and engaging session, the teacher kept telling her sorry and that she will be fine. (I cried at this point of the story, anyone that has ever being stung by a scorpion knows what I’m talking about, talk more of a child who was repeatedly stung by this scorpion in her shoe and no one could realize what was going on in her shoe! “It was time for tea break, she let out another scream, this time stamping her feet on the floor, scattering everything placed on the table in front of her. Her teacher asked what the problem was and she said her leg. The teacher beckoned on her to come but noticed she couldn’t move and her leg was stretched out, looking stiff. The teacher walked over to her and told her to point to the exact place but the child just kept crying and said her shoes. Well the teacher had to take her shoes off and tapped it on the floor, turning it upside down probably to get sand out of the shoes or something”. “My dear friends, It wasn’t sand, no it wasn’t, it was a black Scorpion that fell out of the shoe”!!! Imagine! “The other children didn’t even know what it was, but were smart to obey their teacher as she screamed at them to run out of class. 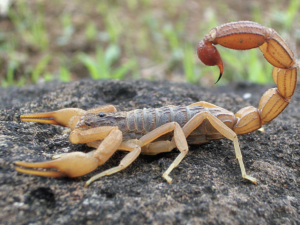 The teacher mustered courage and hit the Scorpion while screaming for help. The cleaners rushed in and made sure that the Scorpion was dead. The school rang the mum to come over, because this is obviously a serious matter . The child had to be cut up and fast too but not without the consent of her mother. Her eyes had changed and were blood shot. The spot where the Scorpion stung (only God in heaven knows how many times) had turned black, I mean black! The leg was already stiff, Kai my brothers and sisters with what my eyes saw today, that child was in pains. Her mother came and they had to cut the spot open first before taking her to the hospital”. This story is so heartbroken, I understand that this child’s mother never wished such for her dear child, but all the same, we have to make sure that our kids’ stuff are well monitored and safe for use. Try to know and be sure why your child is behaving the way he/she does, some kids may be feeling sick and would not able to express their feelings but by crying. While writing this, I felt so bad, but I just had to publish this for mothers and mothers to be to see and read. Don’t make people believe that you’re careless about your child please.